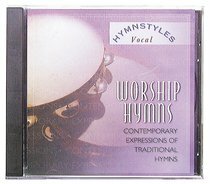 Hymnstyles delivers contemporary expressions of traditional hymns played on different instruments. This CD focuses on the vocal element to create a beautiful and relaxing sound. If you're looking for great music at a great price, look no farther than Barbour's new HymnStyles series. Featuring scores of traditional hymn favorites recorded by talented contemporary musicians, each of the twelve HymnStyles recordings emphasizes a particular style. From small group vocals to solo guitar, from children's choir to saxophone, there's something sure to satisfy a variety of interests -- and it's a terrific value. With its careful blend of traditional hymns and contemporary production, HymnStyles is the perfect way to bridge the gap between modern Christianity's diverse musical tastes.